Three years ago, we said hello to Flow, calling it “…probably the most beautiful task management app yet.” And six months back, MetaLab gave Flow a massive overhaul. In a nutshell, Flow helps teams (and individuals) get things done. Which is all very well and good in itself, but when your service still lacks a native Android incarnation in 2014, it can lead to concerns from (potential?) users. “We’ve had hundreds and hundreds of requests to make an Android version from our users,” says MetaLab’s Greg Voakes. 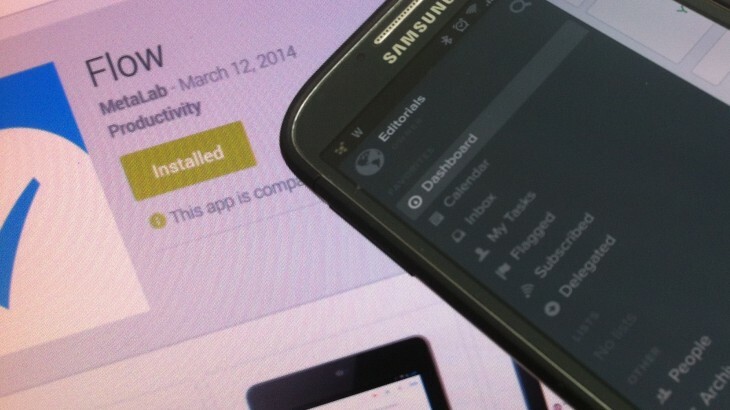 And today, Flow for Android has finally arrived. As with the iOS incarnation, Flow for Android lets you create, view, delegate and delete tasks, organize items in projects and folders, schedule important tasks, and comment on/discuss things with your fellow collaborators. The native Android app essentially reels in all that was available in the mobile Web app, except you get push notifications now. Though you can try Flow for free, you will pay anything from $19/month to $249/month (billed annually) to make full use of the platform within a team. Exactly how much you pay, of course, depends on how big the team is and how much storage you need. At any rate, Flow is finally available for Android in native form, and you can download it now from Google Play.